Towong shire, in north-east Victoria, adjoins the upper reaches of the Murray River east of Lake Hume and extends southwards to Lake Dartmouth. Its name came from the Towong pastoral run (shown on early maps as Nowang) an Aboriginal word thought to mean go away. The run adjoined the Murray River at the extreme east of the shire. The shire has had a complicated history. The shire was also known as the Upper Murray district, an area taken up by New South Wales pastoralists during 1835-40, quite early for Victorian pastoral settlement. There were a few mining settlements, notably north of Tallangatta at Bethanga and Granya. 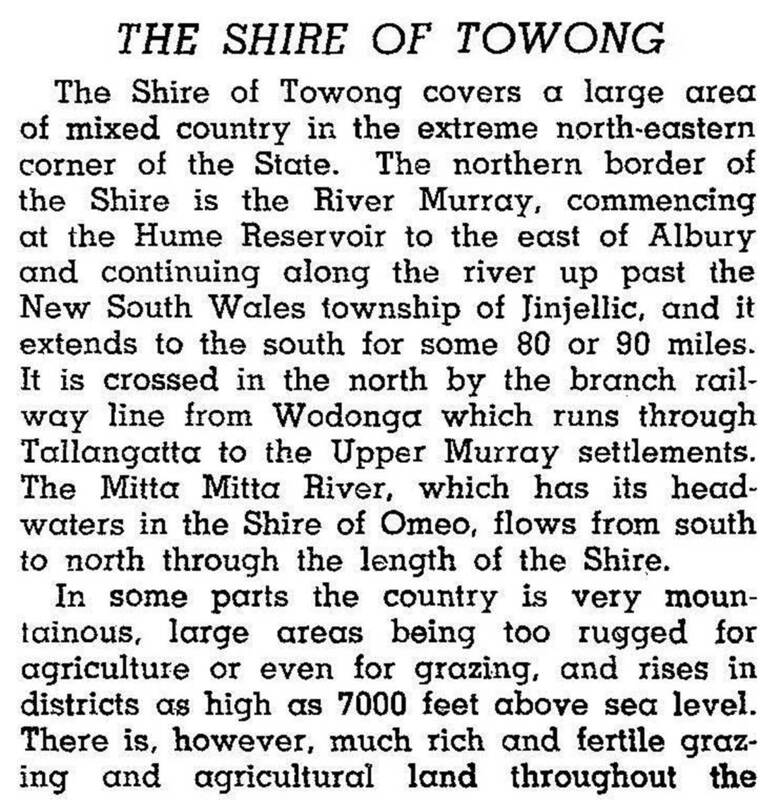 Towong shire was proclaimed on 1 May 1874, with Tallangatta as its administrative centre. Grazing was the main farm activity, with dairying increasing after the 1890s as dairy factories were opened. There were factories at Corryong, Eskdale, Mitta Mitta and Tallangatta. Several important streams pass through the shire to the Murray River: the Mitta Mitta River, Nariel/Corryong Creek and Thowgla Creek. All carry water volumes usually associated with rivers, and the Mitta Mitta was dammed at its confluence with the Murray River to form Lake Hume (1936). Lake Hume was enlarged in the 1950s, requiring Tallangatta township to be moved to higher ground. The Mitta Mitta was again dammed at its headwaters to form Victoria’s largest storage at Dartmouth (1978). The shire’s landscape is probably unique. Many of the valleys are planted with exotic trees, often rows of poplars. The hills are gently rounded, covered with trees and grass that is bleached to pale brown when autumn comes. On 8 March 1974, the named was changed to Tallangatta shire. On 18 November 1994, the shires were reunited and the name Towong was bestowed. The new Towong shire’s administrative centre is in Corryong, with a branch office in Tallangatta. The shire’s area is 6635 sq km. Its main access routes are the Murray Valley Highway from Wodonga and the Omeo Highway from Gippsland. The shire emarked on a number of major projects in the 2010s, including the Tallangatta Integrated Community Centre, the Walwa Community Recovery Centre, the Cudgewa Community Centre, the Tallangatta Multi-Sport Precinct and the Magorra Park Multi-Purpose Centre. At the 2011 census, farming accounted for 22% of employment, including dairying (7%).